To report the technique of hydrodissection of the gallbladder bed, in order to separate the gallbladder wall from the liver surface during microwave ablation of liver malignancies located in segment V.
Between January 2018 and March 2018, percutaneous hydrodissection of the gallbladder fossa was performed during four microwave ablation procedures in three patients (One patient was treated twice for the same lesion, making a total of four procedures for three lesions.) All treated lesions were located in segment V and abutting the gallbladder. Number of hydrodissection needles, volume of hydrodissection, repartition of hydrodissection, separation of tumour from the gallbladder post-hydrodissection, technical success of hydrodissection/ablation, and complications were recorded and evaluated. Hydrodissection of the gallbladder fossa was technically feasible in all four procedures, and microwave ablation was performed at maximum power without any early interruption. Time to perform hydrodissection was 11.3 min on average (range 7–18 min). 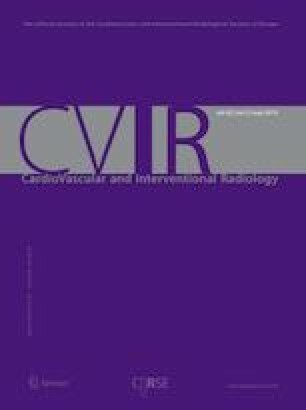 Minimal distance between the ablation area and the GB increased from virtual to 10 mm on average (range 6–13), with a mean volume of dissection of 65 ml (range 40–100). Technical success was 75%. There was no complication related to the hydrodissection itself, and no acute or delayed gallbladder complication. Hydrodissection of the gallbladder bed is a feasible technique to separate the gallbladder from the liver surface. This could potentially decrease the risk of thermal injuries to the gallbladder wall when ablating tumours located in segment V.
Julien Garnon and Afshin Gangi received fees for oral presentations for Canon Medical. All the other authors declare that they have no conflict of interest.